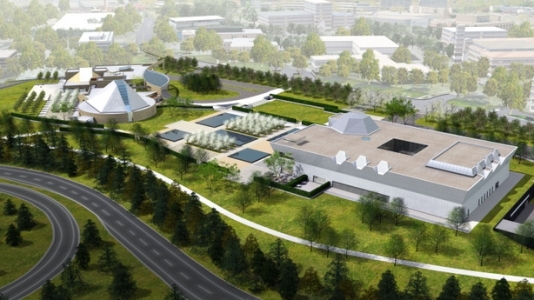 High Profile Jamatkhana and Aga Khan Museum in Toronto: Groundbreaking by H.H. The Aga Khan - 2010-05-28 | Ismaili.NET - Heritage F.I.E.L.D. May 28, 2010 : H.H. The Aga Khan will be attending the foundation ceremony of the High Profile Jamatkhana and the Ismaili museum in Toronto. The Ismaili Centre is an 80,000 square foot two-storey building housing a Prayer Hall, entrance foyers and cloakrooms, social hall, library, meeting rooms, administrative offices, main council chamber room, associated facilities such as washrooms, kitchens, etc. and a two level underground parking garage with a capacity of approximately 300 parking spaces. The Ismaili Museum is a two-storey building with an approximate area of 65,000 square feet housing exhibit areas, workshops, restaurant, café, library, offices, meeting rooms, members lounge and an open courtyard. Plans for same day telecast of the foundation ceremony are under way. It isn’t every day, or decade, that the city gets a beautiful new museum, not just paid for and fully stocked, but located in a part of town where architectural excellence is rare. Toronto’s next important cultural institution, the Aga Khan Museum, and the Ismaili Centre next door will open this fall on Wynford Dr. near Eglinton Ave. and the Don Valley Parkway. The two stone-clad structures sit in a formal Islamic garden adapted to one of the most visible sites in Toronto, a 6.8-hectare high point known to countless commuters.